Do you hear that sound Mr. Owl? It's the invisible hand of the market at work, solving everyone's problems. Robert Nozick was a 20th Century American philosopher, best known for his book Anarchy, State, and Utopia, which defended a Libertarian political view. He believed the only legitimate purposes of the state were police, judges, and national defense. He was largely working off of John Rawls's work in A Theory of Justice, which defended social liberalism. Rawls and Nozick were both professors at Harvard at the same time. 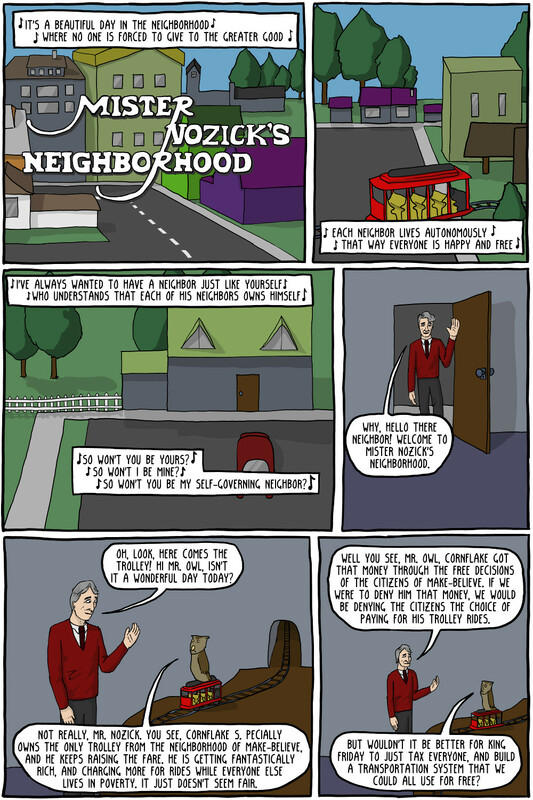 To find out more about Nozick, and how he justified his minimal state, you can read the Stanford Encyclopedia Article. Mister Rogers' Neighborhood was an iconic American children's show that aired on PBS from 1968 until 2001.